Does Dirty Electricity impact Attention? Is there a connection between Dirty Electricity and Attention Deficit /Hyperactive Disorder (ADHD)? According to more than twenty years of science, there are dozens of studies1 that connect electromagnetic fields with ADHD/ ADD, poor concentration, memory problems; slowed reaction time and learning. In the same study, after dirty electricity was filtered from the environment, students improved in eleven of thirteen behaviors, all of which are closely associated with ADD/ ADHD. 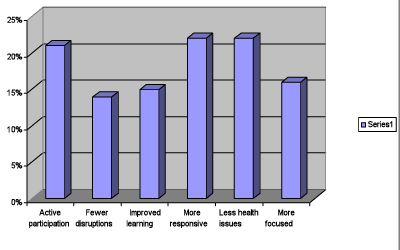 Improvements were observed in the following: active participation (21%); fewer disruptions (14%); learning experience (15%); more focused (16%); more responsive (22%), and less loudness (25%). ADD/ ADHD has been exploding in the past two decades and it may be impacting our children’s ability to learn. Between 3% and 18% of school-age children have been diagnosed with ADHD, and the has diagnosis increased by 22% between 2003 and 2007. Is dirty electricity undermining our children’s ability to learn? Could the perennial under- performance of American students on standardized achievement tests be partially explained by the presence of dirty electricity? The US affords an exceptional proving ground for the question as to the causal connection between dirty electricity and ADHD. While the US is not unique in experiencing impacts from dirty electricity, the levels of dirty electricity are disproportionally high in the US vs. the rest of the world. As electronic devices and efficiency lighting proliferate, one wonders: when the scientific community will finally mobilize to address this growing threat to the learning experience for our children and the quality of life in technological societies?